April is Autism Awareness Month. To help spread the word about Autism we are hosting a giveaway hop. Each participating blog is hosting a giveaway. You will find lots of variety among the prizes. 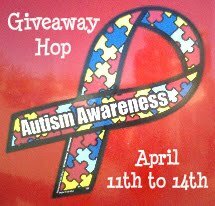 Some of the blogs are giving away prizes that relate to autism, other blogs are giving away gift cards or other prizes and posting information about autism to help make others aware. We realize the causes and treatment of autism can bring controversy. The point of this giveaway hop is simply to make people more aware about the subject by sharing information and experiences. April is Autism Awareness Month. 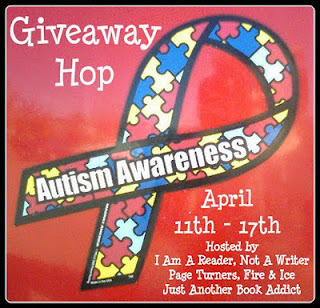 To help spread the word about Autism we are hosting a giveaway hop. Each participating blog will host their own giveaway. There is no requirement on the minimum or maximum value of your giveaway. It’s up to you to decide what to give away but it must be related to Autism or Aspergers in some way. It is requested but not required that you include information about Autism in your giveaway post. 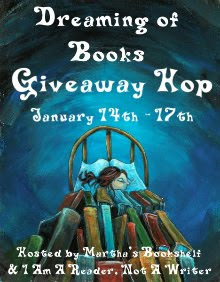 All participating blogs will be linked up through a Giveaway linky. You will be given the linky code to add to your blog so that readers can jump from one giveaway to the next. Please keep the process to enter your giveaway as simple as possible. If you want to participate by hosting an Autism related giveaway please fill out this form.